NOTES: Multimedia kitt with resin, vac and etched bits. Once again, an aircraft for which I could find darn little in terms of background info. The Gerfaut I was the first high powered jet delta-winged aircraft to fly in France, which did so in January 1954 powered by an Atar 101G turbojet with afterburning, providing 9,700 lbs of thrust. 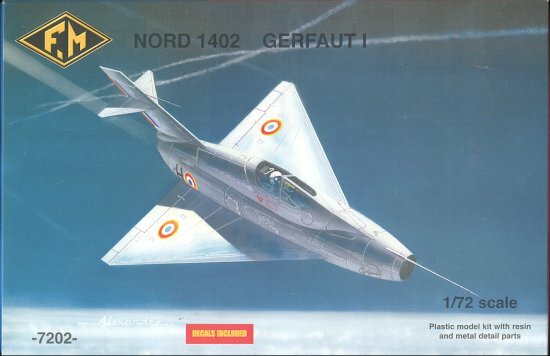 There is some suggestion that this was the first French jet to break the sound barrier, but I've yet to confirm this. Upon opening the package for this kit, I immediately went into a guilt trip for not having completed the Griffon II kit sent a while back. It motivated me to get back to finishing it! As you can see from the image, a lot of parts this kit hasn't. Doesn't mean it will be a snap build; I've learned over the years that it isn't necessarily the case and FM kits have generally proven to be quite challenging. 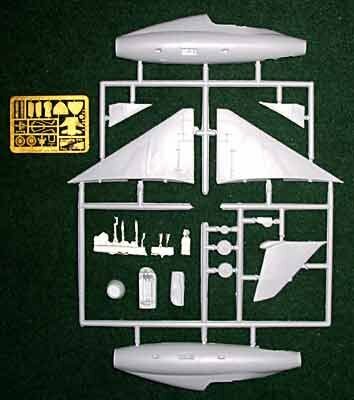 The plastic is in the usual slightly pebbly surface with much flash on the fuselage parts (not shown in the image I swiped from the FM web page). This kit also has that greasy feel of mold release so be sure to wash everything quite well. The bits in the lower left of the image are the metal pieces on the top and the resin bits below that. 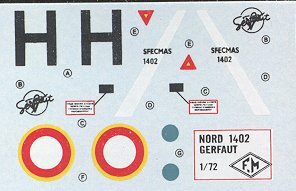 You have resin for the cockpit tub, nose wheel well and exhaust. The parts are well molded and it will be interesting to see if they are as brittle as those in the Griffon II. The metal bits are similar to previous efforts in that the mold has slipped providing some mismatch of parts. They are mostly landing gear, control stick, nose gear door and back of the bang seat as well as two small exhausts. The etched brass bits are for most of the rest of the teeny bits and includes the bottom of the bang seat, an arrangement which worked fairly well with the Griffon II. There are two vac canopies and they are well molded, unlike the flimsy excuses provided with the Griffon II. Having built a couple of FM kits and working on one now, I have to be a bit cautious about them. They have a reputation for not being an easy build and I know several folks who have given up on some of the earlier kits that these folks have produced. The thing about FM and some others, is that they produce subjects that are just too cool to not have a go building them, and this one is headed right for the 'to do' pile.